I first learned the brand PRAKTICA from a magazine dedicated to used cameras. The fact that it was a former East German camera caught my attention. 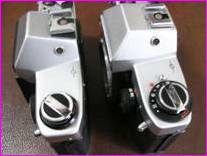 Also, the fact that PRAKTICA was able to design and manufacture electronic cameras captured my attention, since I thought no nation mass produced electronic cameras other than Japan. I went to a camera shop that also sold used cameras (the same shop where I bought the Zenit E a month before), and found four Prakticas. 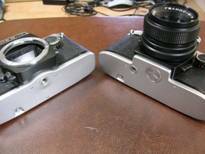 German cameras, even second-hand, are generally expensive, but that's former West German ones. Prakticas on display weren't that expensive, all under 10000 yen. I decided to buy them all, and saved up the cash for it. 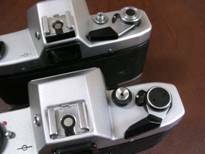 In August 2003, I headed to the camera store, and examined the four cameras. I was immediately disappointed. Two out of four were in extremely poor condition. That left only two. I decided to buy the less expensive one, the Praktica Nova. It cost me 5250 yen. It was my first former East German camera. I've only put one roll of film into it so far, but it seems to work reasonably well, despite the rather unclean finder. 1. Solid construction, with metal casing. 5. The universal M42 mount. 1. Film spool somewhat hard to use. 2. Dirty finder. I'm sure that it's not a common problem of all Novas, but the one I own is the only one I know. 3. Rather large and heavy. 4. Film counter does not budge for some reason, so there's no way of knowing how many shots were taken. Rear view, with cover open. Hinge is located on the rewind knob side. With Pentacolar 1.8/50 attached. Looks great. After using the Zenit 122, I was confident that I can use other Zenit cameras. I went to a camera shop that also sold used cameras. Among the shelf were one Zenit 12 and two Zenit Es (one with Roman characters, the other with Cyrillic characters). After examining the three cameras, I decided to purchase the Zenit E with Cyrillic letters, since I found Cyrillic characters exotic. I also decided to purchase a lens as well, because the appearance of the only M42 mount lens I had (MC Zenitar M2s 50mm/f2, which came with the 122) didn't match the E. The body was priced at 5980 yen (excluding tax), and the lens (HELIOS 44-2 2/58) was priced at 3000 yen (excluding tax). The total (including tax) was 9429 yen. This was my first second-hand camera from a non-Japanese manufacturer. 3. The universal M42 mount. 1. The user can set ISO, but I've no idea how, though I read and reread the instruction manual. I saw this camera in an on-line shop, and decided to buy it immediately (although it was several days later that I actually placed an order). It was in near-mint condition, as advertised. It had everything, including the lens and the camera case. I was a bit surprised when I saw the bottom of the camera. It said MADE IN BELARUS, not Russia. This camera is a modernized version of the Zenit E series. The major change is that the casing is plastic. 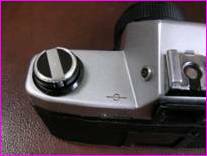 Therefore, it's a lot lighter than the all-metal Zenit E. The controls have been changed somewhat, for reason I don't know. It's not as easy to use as the Zenit E.
The greatest problem with this camera is not the camera itself, but the leather camera case. Whoever designed this camera case must have designed it without seeing or touching the ET. Taking the camera out of the case is a chore. You practically have to destroy the case every time you open the top. 2. The universal M42 mount. 1. The user can set ISO, but I've no idea how. There was an instruction manual, but it was in Russian. 2. Film rewind procedure is rather confusing. 4. Camera case seems to be designed for different camera. This was my first truly foreign camera. I bought it brand-new from an on-line shop in July 2003. I first learned the camera brand 'Zenit' when I was surfing the net under 'Russian Cameras'. The first Zenit camera I saw (image, of course) was the 212. Immediately interested, I searched further, to see if there was a dealer in Japan. 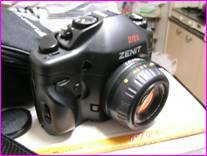 There was one on-line shop in Japan that sold brand-new Zenits. I was able to find the 212. It was then that I saw another camera: the 122, predecessor to the 212. I mulled over for a moment, and decided to purchase the 122 instead of the 212. The 122 was cheaper, so there would be less damage to my wallet in case Russian cameras just weren't for me, and being an older model, I thought that it would be out of production before the newer 212. I placed an order at the on-line shop, but it was over a week before I got a mail back stating that the merchandise was sent. I had arranged to make payment at the time of receipt, but the shop for some reason shipped the merchandise thinking that I had paid in advance. I had to send a mail requesting them to send the bill (God, I'm so honest!). Despite problems, I was able to get the 122 for 13800 yen. The 122 was the first manual focus camera I have ever used (I bought a F3HP several months before, but I rarely take it out of the box). Being used to fully automated cameras, I had some trouble with it (I ruined two rolls of film). But once I learned its correct operation (rather simple), I found it very usable. The 122 is practically a souped-up toy camera. It's passable to those who just want to take pictures and don't care a thing about picture quality, or to those who are tired of no-miss electronic AF cameras but just can't afford MF cameras offered by major makers. Those who want a real camera with all the modern conveniences should avoid it. 1. Inexpensive. It comes with a passable lens and a camera case, so all you need is a film. 2. Works well for its price. 1. It looks inexpensive, with its plastic casing. It's plain plastic, not engineering plastic. 2. Relatively heavy. Though it has a plastic casing, chassis is metal. 3. Unlike the Zenit E I own, there's no Cyrillic characters, so it doesn't feel exotic. I first saw this camera on a webpage selling Russian cameras. What captured my attention was that it had a Nikon F mount despite being a Russian camera (well, actually, it's a Ukraine camera). It was priced at 18000 yen. Not terribly expensive, but no pocket change either. I began to shore up funds purchase it. It was then that I saw the same Kiev at a second-hand camera store during a trip. Priced at 9000 yen, it was very attractive, but it only came with the body only. I heard countless horror stories of genuine Nikon lenses getting stuck permanently to Kiev SLRs, so there was no way I was going to try the Nikon mount lenses I had on Russian cameras. I decided not to purchase that Kiev, opting for the one sold on the web, since it came with a standard lens. I finally gathered the funds to purchase the Kiev a few weeks later. I checked the webpage. ...it was not displayed any more. Apparently, someone bought it before me. Well, it's the story of my wonderful, beautiful, and stupendous life. Everything's available when I don't have the cash, and nothing's available when I do have the cash. I visited the same camera store several months later on another trip. The Kiev was still there, with the body only. I decided to purchase it, since I was afraid that it will be the last time I'll ever see it. Kiev 19 is a relatively solidly-built camera. I tested it without putting a film into it, and it seems to be working fine. 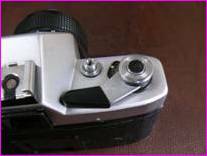 Kiev 19 is a downgraded version of Kiev 17 (maximum shutter speed from 1/1000 sec. to 1/500 sec.). It has since been modified (many say downgraded further) to Kiev 19M. I later purchased the Kiev 17, which is supposedly a higher-grade camera. Many critics blast the Kiev 19 as a downgraded Kiev 17, because of its slower maximum shutter speed. 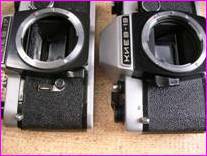 But comparing the two, I find Kiev 19 a better camera than Kiev 17. That's hardly surprising, since Kiev 19 came out 8 years after Kiev 17. This proves that even communist states improve their products. 1. Exposure meter no longer operable. 2. Although it has a Nikon F mount, there are rumors that any genuine Nikon lens (especially AF lenses) will be jammed permanently, so I'm afraid to try any Nikon lenses on it. 'KIEV' inscription is in Cyrillic. I saw this camera on sale in December 2003, at the same camera store where I bought the F4S. I contemplated for a week before deciding to purchase it. It came with the Carl Zeiss Jena Pentacolar 1.8/50 lens and a camera case. It's a fine looking camera, with solid, metal construction. With shutter speed up to 1/1000 seconds, it's a higher grade camera than the NOVA. 1. I seriously doubt that the exposure meter will work, even if I was able to find the correct batteries. 2. Shockingly dark finder. It's nearly impossible to focus. 3. Camera case is hard to open (are there any camera case existing that is easy to open?). Film rewind button can be seen. Two Prakticas. LLC at front. It's a pinhole camera, a type of camera that uses a tiny hole instead of a lens. The kit is equipped with a plastic lens nonetheless. 3. I put a test film in the camera, then wound/rewound the film to check its smoothness. It wasn't very smooth. The film was torn up in the process. 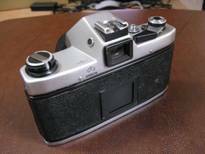 I placed an order for a Kiev 19M (a Russian SLR with Nikon's F-mount) in March 2004. A reply came back a few days later by e-mail, apologizing for the fact that the last Kiev 19M in stock was defective, and replacement for it could not be found anywhere in their inventory (it seemed that it is out of production). There was no use complaining about it, and it didn't cost me a penny so far, so I abandoned all plans for the acquirement of the Kiev, and decided to go for a Zenit. I contemplated which Zenit I should buy. For some reason, I didn't want a second-hand Zenit (probably because I was planning to acquire a new Kiev). 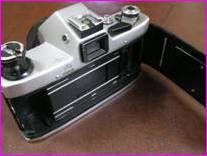 I decided to check the site where I bought my first Zenit. Among many Zenits was the 212K, the very model that taught me the existence of the Russian camera maker. I immediately placed an order, without much thought. The site responded immediately by e-mail, informing that shipment will be made approximately a week later. When I bought the 122, there was a minor problem in shipment, but this time, everything went smoothly. The camera came with a case, a strap, and an instruction manual (a Russian one, and a Japanese one provided by the retailer). The 212K is mechanically identical to 122, other than that it has a Pentax K-mount instead of the universal M42. Externally, 212K has a very modern form, totally different from the orthodox-looking 122. It almost appears as if it has auto focus, but it's a fully manual focus camera. I first saw this camera on a webpage selling Russian cameras (same webpage where I bought Zenit ET) on May 2004, and decided to purchase it immediately. Price was the major factor for the purchase of this camera (10870 yen), but the main reason was that it came with a lens (HELIOS-81C 50mm F2.0). I purchased a Kiev 19 earlier, but it only came with the body only. Hearing horror stories of genuine Nikon F-mount lenses getting fixed permanently to ill-fitting Kievs, I was reluctant to test the F-mount lenses that I had. The Helios lens was a perfect fit for both 17 and 19. Kiev 17 was the first former Soviet SLR that adapted Nikon's F mount. A downgraded version, Kiev 17 (maximum shutter speed from 1/1000 sec. to 1/500 sec.) was later introduced. 1. Although it has a Nikon F mount, there are rumors that any genuine Nikon lens (especially AF lenses) will be jammed permanently, so I'm afraid to try any Nikon lenses on it. 2. Some controls (shutter speed control, film rewind button) at awkward positions. 3. No ISO dial. Supposedly downgraded version, Kiev 19, allows manual ISO setting, but this camera has no such dial. 4. Tip of the winder hits the pentaprism, causing scratches.